In 2020, two of the most famous monsters in movie history will battle on-screen for the very first time (or the second, if you remember their Japan-backed “versus” movie from 1962). We’ve already seen what one contender can do, that being Godzilla in the 2014 reboot, but now it’s time to see what the revitalised version of King Kong is made of, in director Jordan Vogt-Roberts’ Kong: Skull Island – and to those who can’t possibly imagine a small-ish ape going up against one of the largest creatures in monster movie history, I’d say you might want to reconsider your stance, because as far as this extremely fun and enjoyable movie is concerned, Kong is more than a match for that giant lizard. 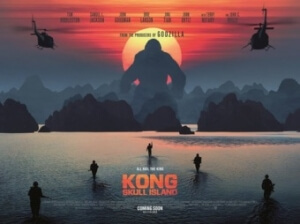 The film is set in the 1970s, as the Vietnam War is just starting to wrap up, and representatives from the mysterious Monarch organisation – the same one featured in Gareth Edwards’ Godzilla – are lobbying for government funding to back their latest expedition, to the fabled Skull Island which has recently been located after years being missing. Once they are approved – otherwise this would be a very short movie – the two representatives (played by John Goodman and Corey Hawkins) recruit a small group of soldiers led by Colonel Packard (Samuel L. Jackson), as well as a British tracker (Tom Hiddleston) and an anti-war photographer (Brie Larson), to explore the mythical island, but are quickly intercepted by the giant ape himself, as well as a whole host of enlarged monsters that inhabit it, and so it’s left to the surviving teammates to find a way off its shores in one piece. There’s a large cast of humans in this film, from popular actors like Hiddleston and Jackson to character actors like Goodman and John C. Reilly, who pops up as a pilot who’s been marooned on the island since the Second World War, but the real stars of the film are the monsters, who through some creative designs and some rather good visual effects work (they look slightly less cartoony than the trailer makes them out to be, especially in close-ups) are stunning and awesome to watch. Kong is especially cool here, as he’s given a lot of screen time to just be the giant, badass ape we all know him for (a far cry from 2014’s Godzilla, which was oft criticised for not having enough Godzilla in it), whether he’s fighting other giant monsters and even helicopters, or just wandering about his domain without a care in the world. Whenever Kong shows up on screen, the film reaches peak awesomeness as you’re constantly rooting for him to win in battles against other giant monsters, or even the humans themselves. Speaking of whom, the human cast often tends to get lost in the mix of everything else, as is the case with a lot of giant monster movies. The problem is that there’s too many characters to care about, and more than half of them aren’t given much time to make a connection as the other half; by the end, you’ll have no clue who actors like Jing Tian was playing, nor Jason Mitchell, nor Thomas Mann, nor even Toby Kebbell who takes double-duty as a Kong motion-capture actor and as an Army General, though in the case of the latter the role turns out to be so brief that you’ll be wondering why a known actor like Kebbell was even cast in this role. As for some of the more prominent actors, it is Jackson, Larson and Reilly who make the most out of their simple characters; Reilly in particular is having so much fun in this role, and gets a rather sweet arc that has you rooting for him to make it out alive so he can fulfil it. If the movie had focused on much fewer characters, namely those three, it wouldn’t have mattered as much, but the fact that there are so many we are asked to care about makes it harder to remember who they were when they are faced with such dangers. The film also has a few structural problems, like a first act that seems to go by rather fast, as if the movie itself doesn’t care about the whole set-up with the humans and just wants to get straight to the monster-on-monster action, but let’s be honest: you’re not going into this film wanting much of that, anyway. You’re more than likely coming to see Kong and the many monsters duke it out with each other, and luckily the film offers plenty of that. The action is fun, suspenseful, unpretentious, and highly entertaining even in its sillier moments (John C. Reilly brandishing a samurai sword is every bit as ludicrous but awesome as it sounds), which more than makes up for its bigger flaws like quite a few of its underdeveloped characters. It’s a total B-movie, but it’s the kind of B-movie that you can have as much fun with as you possibly can without feeling guilty afterwards, and still enjoy yourself even when coming across a few bum notes. Kong: Skull Island is a fun, enjoyably silly monster movie that’s unashamed of its B-movie traditions, but also respects the audience enough to give them a highly engaging film with plenty of creative monsters, an ensemble cast with a few standouts despite most of them being lost in the mix, and a whole lot of action-packed scenes of effects-heavy mayhem that make the price of admission worth it.